The Police Explorers, Post #124 are affiliated with the National Boy Scout Organization; focusing on providing basic training for Law Enforcement in a safe environment for children and young adults ages 14-21. Along with the training the participants also learn the importance of teamwork, communication, tactics, and safety as it pertains to their possible career choice of Law Enforcement. The Explorers learn with both a hands-on scenario based approach, along with some light bookwork. 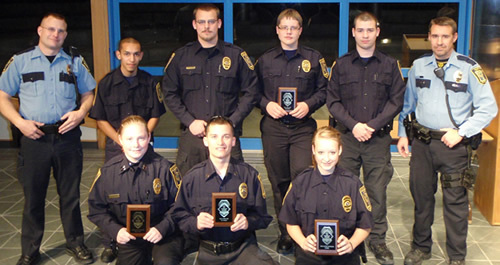 The Explorers contributed countless volunteer hours over the 2010 summer. The events included the third annual Relay for Life kick-off hot dog feed where the Explorers served up food and drinks. The Explorers provided security for the Fourth of July park festivities. They also pounded in posts and hung signs for parking/no parking zones along the parade route and Hog Jog route. Explorers also provide traffic control at various events and provide assistance with the “National Night Out.” The Police Explorers provide security for the Mower County Fairgrounds by being paired with Police Reserves. They also provide overnight security for the National Barrow Show held at the Mower County Fair Grounds. This program is designed to be a safe, fun and educational learning experience for the youth in our community. Members are expected to follow all Exploring guidelines and remain law abiding. Meetings are normally held at the Law Enforcement Center at 201 1st Street NE, on the second and fourth Sunday of the month, from 7:00pm to 9:00pm. The Explorers Post is managed by Officer Tischer and Officer Jones.